When publishers post content on Facebook, the goal is to grab as much positive attention as possible, while engaging with your audience. But figuring out how to do that isn't always easy. Luckily, some recently released research can teach you a lot about viral content creation, particularly when it comes to how you use video. The minds at BuzzSumo analyzed two billion articles and posts that were published on Facebook in 2017 - here's an overview of the top content over the year, and some insights which will help you improve your Facebook game. Examining the most shared content on Facebook shows that users are often quick to spread material which is entertaining, heartwarming, or inspiring, even if it the article or video doesn't originate on the platform. And while most posters can only dream of engaging with an audience at the level of a music video, the data also shows that content with a strong tribal element can be incredibly powerful. Additionally, a lot of people use Facebook to keep up with the news, but the results can be somewhat hit and miss, as multiple organizations generally cover the same story. However, exclusive or 'breaking' content can reach unicorn levels of engagement - particularly if it connects with a large audience. Quizzes have been popular since they began popping up on social media, but they aren't reaching the level of engagement they once did, possibly due to the degree of saturation. They also rarely result in backlinks, even though they're widely shared - likely because these posts are seen as fun, but not necessarily evergreen. Travel and adventure pieces can also reach epic heights, often because the content is inspiring in nature and augmented by the fact that these articles tend to use striking visual images that could serve as a mental escape from the day-to-day. Heartwarming stories can also gain a lot of traction, as most people enjoy seeing the good in the world, especially in the wake of a tragedy. Further, content that's supportive in nature, acknowledging a group's hardships and offering reassurance, can also generate attention. The results of research studies or articles about scientific findings are another category that can do well on Facebook, particularly when presented with an attention-grabbing headline. On the flip side, opinion posts can be big on social media, especially if they speak to something at the forefront of everyone's minds. 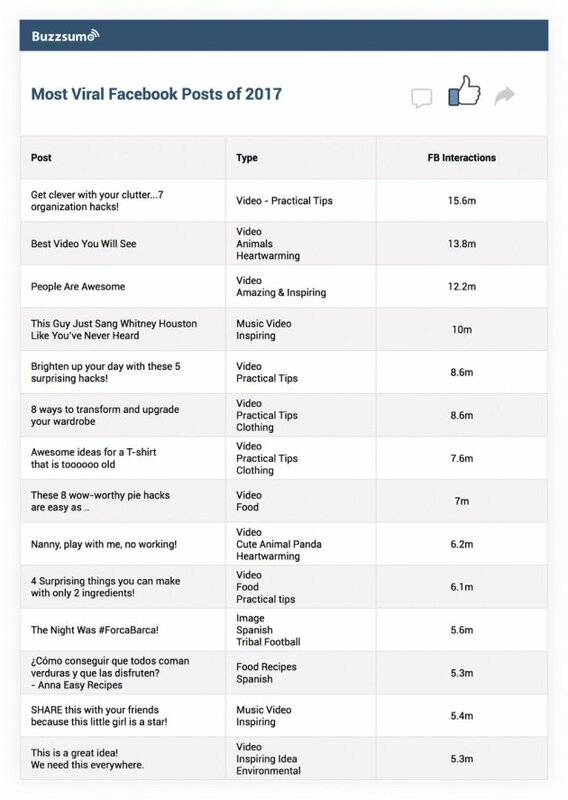 The graphic on the most viral Facebook posts highlights the power of video on social media, with 17 of the top 20 posts featuring that format. Again, music videos are featured heavily, as well as heartwarming and inspiring content, including multiple cute animal videos. Practical hacks and food-related videos are also frequent entries on the list. One of the most important points made in the research is that these posts are outliers, and many of the Pages which share such content have massive, established audiences. The more followers a Page has, the easier it is to get their content in front of users' eyes, increasing the potential for a huge number of shares. However, publishing engaging content is the key to potential social media success, as is what attracts people to your Page, leading to followers and likes, and resulting in shares. As the research shows, on Facebook, video is huge, making up the vast majority of the top posts. That means, you need to consider posting videos, if you aren't already, particularly because engagement levels with images and link posts have been declining rapidly. Additionally, Facebook is favoring video content, including those produced on Facebook Live, increasing the odds of it appearing in news feeds. With the battle against Facebook algorithms on-going, shifting to a preferred format can help you get ahead. Having a video-based strategy can help boost your organic reach, while also potentially helping your Facebook ads gain more traction, helping you make the most of your advertising dollars and connect with the widest possible audience. As your audience grows, it's easier to get your content shared, especially if your focus on high-quality clips and engaging content. Your videos don't have to be lengthy to be successful - clips as short as 90 seconds can do the trick. However, you do need to focus on high production values, including striking images and high-quality sound, or your message isn't likely to be heard, let alone shared. If you're looking for an angle for the video, focus on being entertaining, inspiring, or heartwarming, as these may be the easiest to incorporate. However, if practical hacks match up to your product offerings, don't ignore that route as a possibility also.